Subaru Cherry Blossom Festival welcomes D.A.K to Sakura Sunday! D.A.K. is an entertainment group based in Tokyo, Japan. They perform a dance incorporating Awa Odori, a joyful traditional and modern dance! 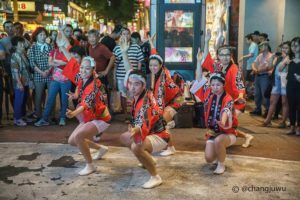 The Awa Odori Festival is Tokushima City’s most famous attraction and the subject of national attention every August during the Obon festival season. Come watch D.A.K’s team of Awa Odori dancers bring a taste of Obon to Sakura Sunday at 12:15 PM on the Main Stage! To find out more about D.A.K, check them out on instagram @d.a.kawa or visit their instagram webpage!